A spontaneous protest has engulfed New York City’s JFK airport after a number of immigrants, including US green card holders, were detained there Saturday, on the back of travel restrictions introduced by President Donald Trump. Trump’s executive order on Friday banned citizens from seven Muslim majority countries from entering the US for at least the next 90 days unless they possess a diplomatic visa, and barred refugees from Syria indefinitely. At least 12 immigrants were reportedly detained at JFK airport on foot of the ban prompting activists to quickly organize a protest calling for the release of those refused entry into the country. Iraqi translator and former interpreter for the US army during the 2003 invasion of Iraq Hameed Khalid Darwees, was one of those detained, but was released after his lawyers petitioned a federal court. The size of the crowd has been growing since early Saturday after news of the protest spread on social media. Other travelers affected by the ban were reportedly blocked from boarding flights to the US or turned back on arrival as Trump’s order was promptly implemented. 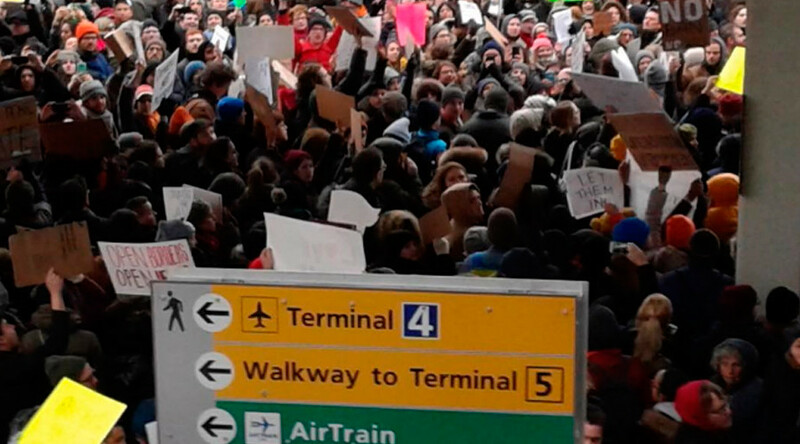 JFK Airport took to Twitter to warn travelers that they should take extra time to get to the airport due to increased traffic as a result of the demonstration. The New York Taxi Alliance tweeted their support for the protest announcing a one hour work stoppage at the airport as a measure of solidarity. Meanwhile, a rally is taking place at Washington’s Dulles International Airport to welcome refugees coming into the country.